Fatigued at the end of a very busy week, on tour on the south coast, Lions Youth Brass came straight off the coach to give a concert organised by the Rotary Club of Sandbach. This has become an annual tradition with the band playing to a capacity audience of parents, Rotarians and members of the general public. The audience have come to expect a very high standard of playing from the band and they were not disappointed on this occasion. Director of Music, Nigel Birch, (who was made a PHF last year for his work with young people and music) was proud to let the band and the audience know that this year he has been conducting one of the best balanced bands that he has worked with over a very long period. Inevitably, members of the band leave to go on to higher education  there were four this year - but talent is always on hand from the junior band to take their places. 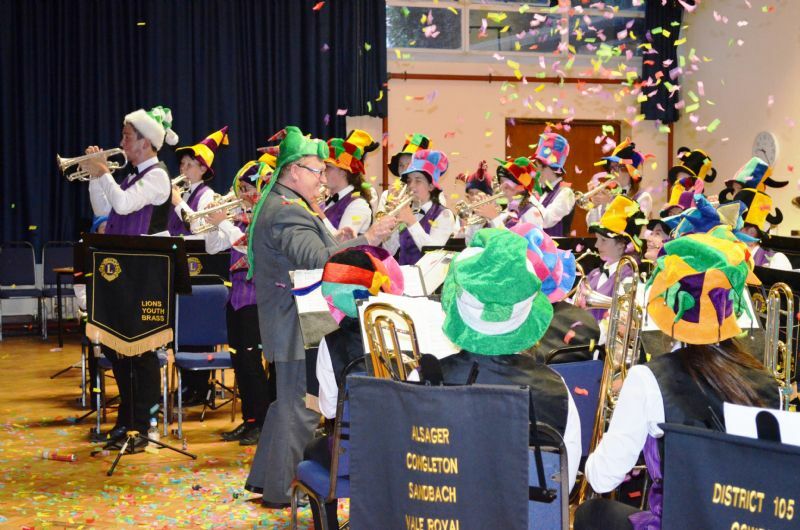 The audience enjoyed a selection of classical and light music, with solo performances which delighted the senses, finishing with the spectacular Carnival in which everyone lets down their hair and puts on fancy hats to round off an evening to remember. Nigel wound up by thanking everyone in and involved with the band, from kit-masters to coach drivers. He made particular mention of the support that the band has received over a number of years from the Rotary Club of Sandbach, in terms of both money and effort. Rotary President, Dave Lewis, responded by congratulating the band and their organisers for a very professional and enjoyable experience and thanking them for helping the club to raise funds for many charitable projects over the years. The proceeds of the evening will be used to give a donation the band to offset their accommodation costs and for charities nominated by the club.